Another year, another successful Rocky Mountain Challenge. The East Coast Elite League (ECEL) event, hosted by the Rocky Mountain RoughRiders organization Oct. 2-4 at the Ice Centre at the Promenade in Westminster, saw a wealth of talent on the ice and numerous junior and college hockey scouts and coaches in the stands to take in the action that featured 16U AAA and 18U AAA teams from more than 10 states and Canada. 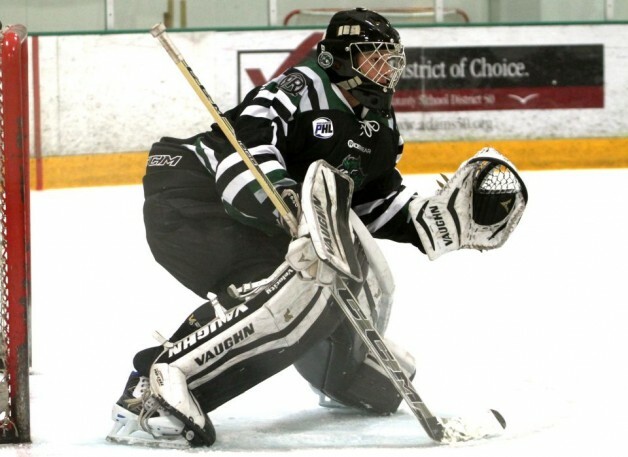 The RoughRiders’ 18U AAA National team went 4-0 at the event and only allowed one goal as goaltenders Zack Larocque and Cody Christofferson (pictured) dominated. Larocque was with the United States Hockey League’s (USHL) Sioux Falls Stampede for most of September and Christofferson was a Cedar Rapids RoughRiders draft pick in Phase 1 of the 2014 USHL draft process. At the 16U AAA level, the RoughRiders fashioned a 2-1-2 over the weekend following up a 4-0-0-1 performance at the North American Prospects Hockey League Super Showcase in Blaine, Minn.
USHL director of player development Doug Christiansen was in Westminster and made a presentation to ECEL members focusing on the history of the USHL and its college placement track record. Next up for the ECEL is the East Coast Holiday Classic in Cromwell, Conn., Dec. 18-20 and All-Star Game on Dec. 18 on the campus of Yale University.